In 1973 when Reviva Labs was established, the word “Exfoliation” was unknown in America. That was 37 years ago. It’s when Reviva Labs introduced the first non-chemical European Exfoliant to Health Food Stores, known as “Light Skin Peel”. It’s unique formula and blending remains unduplicated today. Reviva has been around for a very long time. You can find their products in your local whole foods grocery markets and tons of organic stores all over. I like many other people strugge with dark circles under my eyes. It's my worst skin problem. Dark circles can make you look tired, old or just plain gross! The Reviva Collagen Fibre Eye Pad Kit ($38) comes with 4 pairs of eye pads, and a skin energizing gel. Although the price may seem steep for 4 sets, the results are immediate and botox like. "Diminishes wrinkles, dark circles and puffiness. Under eye area looks "lifted" results are temporary, but added usage brings cumulative benefits"
I really like the kit, the process is very different then other eye gels I've used. You apply the gel under your eyes, and then you apply the eye pads over the gel. At first, it's just like a paper cover- but then you put a little water over the pads, and they form into your skin, almost like a mask. After 20 minutes, your face looks more fresh, and ready for the day! Because I only have 4 I plan on using these for days when I feel extra tired or when I have big plans. I hate when products lie to you by saying it's like magic and will work right away, but the Reviva Eye Pads really do what they say. Now the results won't last forever, they work best with continued use, but using one every week or so, you should be able to keep up the fabulous fresh eye look! 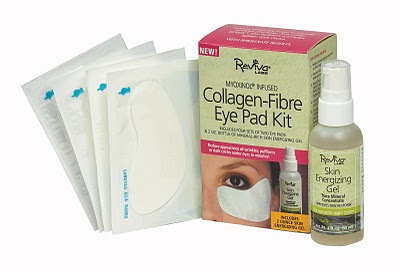 You can purchase the Eye Pad Kit at Reviva.com or your local organic store. The Giveaway: One lucky winner will win a Reviva Labs Eye Pad Kit ($38) To enter, visit Reviva and tell me another product you're interested in. Good luck. You will love these eye pads. Open to the US only. This giveaway will end 10/2/2010. Winner will have 48 hours to respond to the winning email or another winner will be chosen. I'd also like to try their Firming Eye Serum with Alpha Lipoic Acid, Vitamin C Ester & DMAE. I would get the Hyaluronic Acid Serum for the face. Subscribe to Bella's email newsletter. I'm interested in the Elastin and Dmae Night Cream. I would like to try the Makeup Primer. If this product works as well as you say, it will be a great boon for those of us with dark circles under our eyes. I would also like to try Firming Eye Serum with Alpha Lipoic Acid, Vitamin C Ester & DMAE. I would be interested in the Collagen Serum! I'm an email subscriber #1! I would like to try the Hyaluronic Acid Serum, skin science! I'd like to try the DMAE Firming Fluid. I'm interested in the brown spot Night Gel wGlycolic & Kojic Acid 1.25oz. Under Eye Dark Circle Serum 1oz or Makeup Primer 1oz! I would like to try the Collagen Serum from Reviva. I would like to try the Light Skin Peel. I would also like to try the Collagen Serum. I am a fan of Reviva Lab via Facebook as Jill Myrick. I am a fan of Reviva via Facebook as Jill Myrick #2. I'd love to try the Seaweed Soap All Vegetable 4.5 oz Bar.